Indonesia International Pet Expo 2017, is the annual biggest pet expo ever in Indonesia which organized by PT. Tarsus Indonesia. This event is held for 3 days, start from 28th until 30th July, 2017. This event contains pet show, community gathering, and also the exhibition of all material from every pet ? owner needs. Unlike the past years, this time IIPE event promo want to ?go digital? to reach more visitors. By our experience, they decided to choose Next Digital Indonesia as a part of their event promotion team within digital. There are so many Indonesian people who love pets, but not all of them who really know about the event like this, even the biggest one. So by learning about IIPE event in the last few years, we all here know this event can be more ?crowded? when using digital marketing approach. Then, we start to think. This event is divided by two main targets to achieve. First, for the exhibitor who wants to promote their merchandise about pets, and the second is for any visitors who came to this event. So our challenge is to reach as much as possible this two main target by using digital and get a real big hype during the event. Then, we start to act. Our first strategy is to get more effectiveness. So we start to split our campaign plan into three periods. The first period is to reach awareness for Exhibitors who want to get involved in IIPE event. The second period is to reach awareness for anyone who wants to come as a visitor. And after that, we get into the third period which is the ?after post event? report to any IIPE Social Media. To get high awareness in each period, our creative team start to concept a premium unique design for Facebook ads, Instagram ads, and also GDN based on target market behavior and interest (whether is exhibitor or visitor has a different approaching style). Meanwhile, our SEM team trying to maintain IIPE ads in Google search by using related quality keywords. ?Pets love social media so much?. There are so many contents in social media about pets around the world. And we didn?t want to miss this opportunity. 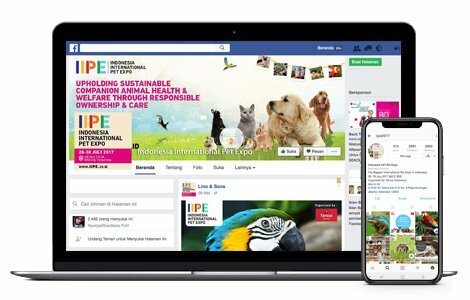 As a second strategy, our team also build a solid social media for IIPE and maintain it carefully on that three periods of the campaign to engage every pet lover in Indonesia, both for exhibitors or visitors.